go to the EVENTS page and check out the line up and event descriptions for 2019! Free Flow Ongoing (Online)Events: "Energized Life"
​Lighten your Life with Pure Love Energy that Heals and Clears. It's time to JUST BE... and Love it! This is an ongoing series of healing, clearing, and inner-guidance meditations. There are no fixed dates because these will be offered when the energy is present. If you would like to be kept up to date about when these online sessions will be taking place, please email me and include your telephone number (TOPIC: Energized Life), and I will add you to my WhatsApp group. The purpose of this group is to be informative, so that you know when and what time the next session will be. ​You will receive a link so you can participate live if you choose to. ​After the session the audio and video recording will be posted in the group and usually also on YouTube. Recordings from previous classes 1 - 5 and support sessions 1 & 2 are still available. For more information feel free to email me. “Soul Fusion” ...A beautiful Sunday with 11 souls who came to welcome and manifest their true authentic pure divine infinite essence into their magnificent physical vessels. A day of awakening... remembering our unique formula born from Source... recognizing when we are acting from the Ego based on the illusion of separation and when from the place of our authentic Being... and deep meditation on many levels, guided by visualization, consciousness journeys, light language, instruments, songs and Music From Source. Abundance (overvloed) en Lichttaal gaan hand in hand, ze maken deel uit van elkaar! JIJ bent een unieke authentieke expressie van de Bron, jij bent het levende bewijs van Abundance! deze ervaring word weer totaal nieuw (want daar gaat Abundance natuurlijk ook om! ), je gaat totaal nieuwe lagen ontdekken van jouw Universele Zelf! * Het zal ook duidelijker worden wanneer je nu kunt spreken van lichttaal? Hoe weet je wanneer jouw expressie in taal, schrift of kunst lichttaal is? Wat voor een zin heeft Lichttaal? * We gaan ook samen belemmerende blokkades opruimen rondom ons universele verbinding en overvloed in ons leven, en nieuwe pure krachtige energieen integreren. * De meditaties zijn gericht op verbinden met je Hoger Zelf, verbinden met de universele energie van Overvloed en Innerlijke Stilte (Mind Quieting) wat super belangrijk is voor het ontvangen van je “Higher Guidance” en dus ook jouw lichttaal expressie. ​Visit the REVIEWS page to read more about it. Support session 01 took place on May 2nd. This is a free session and the recording is available for everyone who has followed at least 2 of classes 01 - 04. Scroll down further on this page to view the line up of upcomming classes. You receive the ZOOM link (online meeting) and instructions once you register for a class. This series is for everyone who is interested in discovering more about Parenting or working / connecting with children from your Higher / Universal Consciousness. It will be in English but you may ask your questions in Dutch if you like. We always do a connection / meditation together and I guide the first half of the class. You may also ask questions or share your thoughts and feelings, and we will do some clearing / healing / releasing work. We meet every 2 weeks and each time I have a wonderful guest speaker who will then guide you through the second half of the class. We will be enjoying many interesting topics and also be doing deep clearing and healing work together. Introduction, what is Higher Consciousness parenting about, raising our vibration, creating a sacred space, stopping to feel first and clear your own "emotional garbage." before reacting. - creating a sacred space with our “heart light” and responding from our heart space. - meditation / connection & clearing blocks based on “fear of failure” and “need of approval”. - positive parenting: communicating in a positive sense by expressing what you DO want. - the difference between reacting and responding. - recognizing when your own emotions are getting mixed up in a situation or a child’s emotions. - story telling from the Heart. - The first 4 of the "8 Essentials"
- Seeing our children as equals because they are also a unique consciousness and full being, just in a childs body. - Responding from a place of love energy and our alignment. - Being aware of what thought patterns and belief systems keep pulling us “off center” and the importance of clearing these programmings and patterns. ​These classes are designed to enhance your ability to connect to your cosmic self, expand your creative ability and master your mind focus. These EXPERIENTIAL classes include practical tools such as learning a focused guided meditation for quieting and concentration followed by automatic writing or learning to speak a "star or galactic language" or identifying the cosmic origin of a musical tone or vibration through music. ​May 9th and 10th: "Lente Festival"
An online ZOOM meeting for everyone in the Light Language Facebook group. Send me an email if you would like to receive this recording. There are also more recordings available of group Light Language sessions for those of you who are members of the private Facebook group or have been to the group events. Theme: Self-Healing & specific multi-dimensional energy field clearing with Light Language. Read more about this event HERE or view this event on FB HERE. LIGHT LANGUAGE 02 is for those who have been to the activation / remembering Light Language events (class 01), and are discovering, integrating and implementing their authentic soul-light expressions. Please feel free to email me (Kaiyann: Cosmiquefocus@gmail.com) if Light Language is already something you are familiar with and you are used to expressing and you would like to join us! In this experiential seminar, consciousness teacher, visionary author and filmmaker Caroline Cory explained the ways in which human consciousness may evolve and co-exist within the surge and expansion of materialism and Artificial Intelligence. Caroline offered practical tools that expanded our Higher Consciousness and succinct discernment. This work allows you to navigate the new earth grid and identify clearly the truthful information behind what is emerging in all areas of technology, communication, education, governance etc. and manifest your own reality no matter what the collective may be creating. 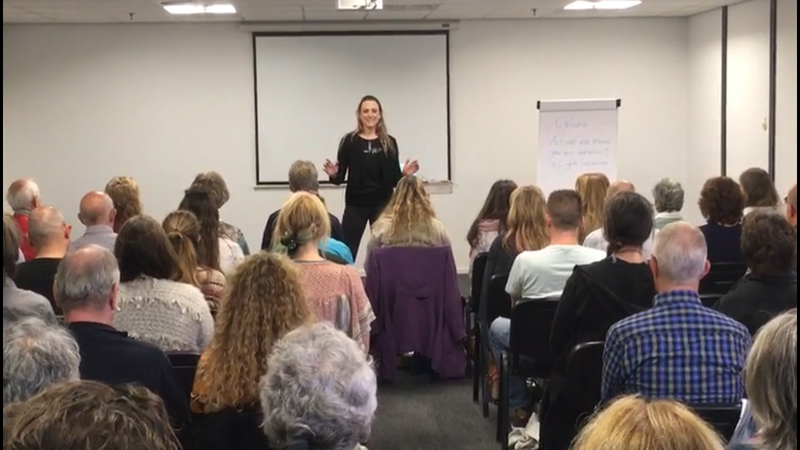 In this workshop, Caroline assisted us with our own discernment and guidance system and delivered personalized messages and information to the group. ** We gaan vooral in de flow van wat er ontstaat door de kracht, energie, bewustzijn, intenties, gaves, van iederEen en de groep als Één. ** Neem een kussen mee als je wat zachter wil zitten op je stoel of de grond, een dekentje en warme sokken. Molenrand 2, 5421 VZ Gemert. Uitloop tot 22.00, om even rustig te landen en evt. nog na te praten of wat thee te drinken als je wilt voordat je naar huis gaat. Daar zal een contributie doos aanwezig zijn. Koffie en thee en gezonde lekkers is er ook voor jullie natuurlijk. Kom als je wilt komen en laat me dat gewoon weten door te klikken op GOING bij het event, of ga naar mijn “contact” pagina. Graag dus een WEL een EMAIL sturen en GEEN WhatsApp of Messenger bericht om je aan te melden.